Many thanks to Fiona Millar, lecturer at The University West of Scotland (UWS) Ayr Campus for Kindly inviting us back on September 15th to meet and speak with 2nd year Nursing students over two sessions. We are so honoured to be have invited each September over the last years and you can read the story of our visits here from 2014, 2015, and 2016. 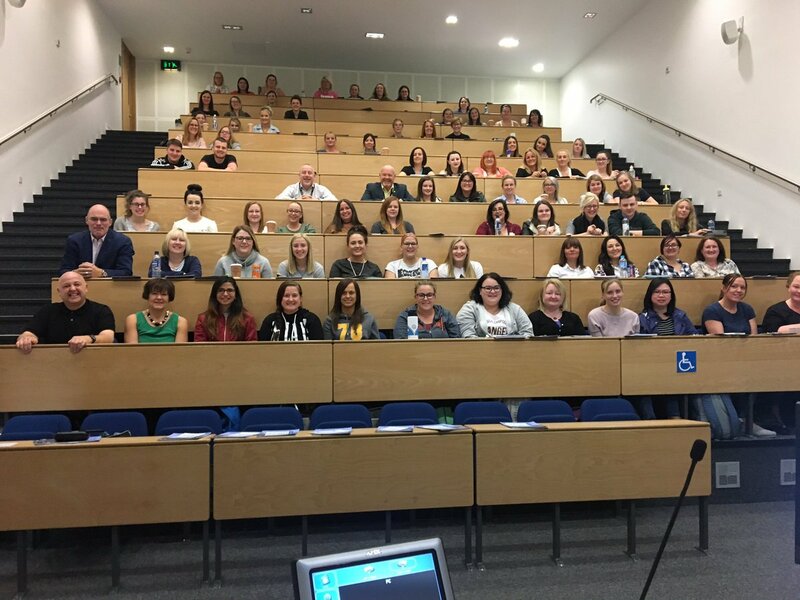 Each session was broken into three parts with Fiona sharing the 2030 Nursing vision along some personal reflections and a great questions and answer session with our future nurses. Shaun’s session was around turning good intentions into purposeful actions and the improvement model used in Scotland. 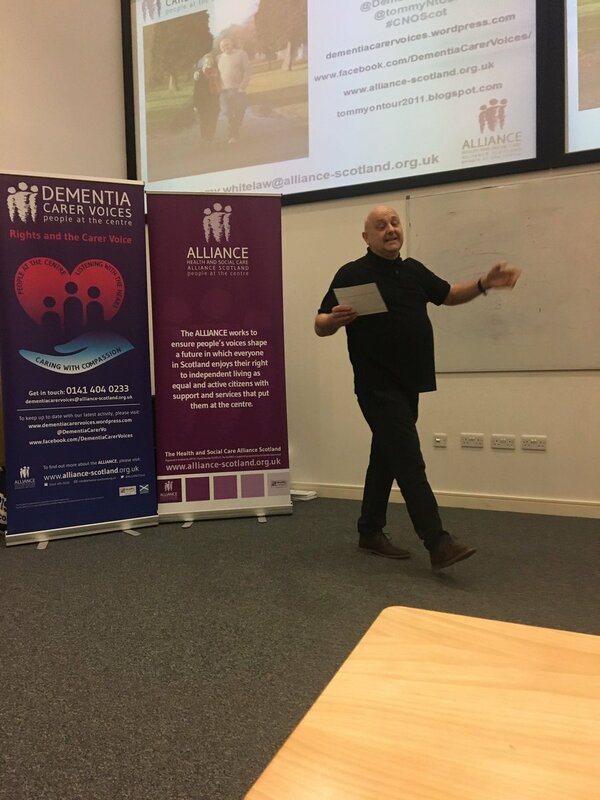 Our very own Tommy spoke about the DCV Project, personal experience of caring for his mum Joan, the letters we receive, our Make a difference campaign and our new publication. Between sessions was also a wonderful conversation over lunch with students and lectures along with Professor Paul Martin, Vice Chancellor at the University. We were so very honoured to be part of such day with Fiona, Shaun the student nurses and University. We were very well looked after and we look forward to returning to launch a UWS Ayr Campus pledge tree. Thank you once again to Fiona Millar for arranging the day and the wonderful students for the pledges below. I pledge to always recognise the privilege of being involved in supporting people with dementia and their families, throughout their own personal journeys. I will do this by making time to listen to what is important to them, so I can deliver compassionate care upholding respect for their dignity and with regard for their life story. My pledge is to always treat people I provide care to and their families the way I want to be treated myself. I pledge to work to the best of my ability to provide the best possible care to patients under my care and provide patient centred care at all times and promote independence. My pledge is to listen and understand what the person’s needs and wants are. My pledge is to make sure I am able to help someone smile and be more positive. My pledge is to look beyond the illness/condition and see the person. I pledge to acknowledge the individual and ask what matters to them before I recognise them for their illness. I pledge to look at the person – not the condition, and not ‘he wee patient in bed space…’. I will try to make someone’s day a little better and make them feel safe and worthy of my care and attention. I pledge to have more patience with residents/patients and spend more one to one tie with them. My pledge is t always be kind, patient and mindful when caring for people. My pledge is to always see the person not the illness. To make a difference no matter how small, even if it is only to make someone half smile or listen to a story I may have heard 10 times already as if it’s the first time I’ve heard it because that’s what matters to them, and so it matters to me. I pledge to try to spend more time with patients to get to know them and be more caring. My pledge is to ensure I know how my patients are feeling daily. Also, I feel it costs nothing to give someone in need my time. If I can make the smallest difference to someone’s life when they’re feeling at their lowest and encourage their wellness. I pledge to make the smallest difference to someone’s life. My pledge is to see every person as more than their condition. They are ‘someone’s’ everything. I pledge to be the type of nurse that patients, carers and families admire. To be there and support the individual needs of service users. I pledge to make sure I listen to each and every person I care for and be the voice for them and their family. I also will offer my hand to hold when it’s needed the most. I pledge to ensure patient normality of their lifestyle. To respect and ensure their lives and their dislikes are met and to develop care around them and their families wants and needs. I pledge to make sure every patient is treated as the individual human they are, ensuring to make their time in my care as personal to them as possible and to make them feel as supported and well cared for as I can. My pledge is to be caring and compassionate towards patients and share my knowledge of dementia. I pledge to play a part in everyone’s love story I care for at ny point in my career and studies. I pledge to take the time to get to know my patients and explain things to them. I pledge to continue to strive to deliver the best quality care for each individual I care for, to listen and make a difference to their lives. I pledge to find out about the person before interacting. I pledge to be kind, understanding and a listening ear. I pledge to take time to listen and get to know every patient and family I come across. I pledge to give more time to patients by communicating with them to know them better and know what they need. I will always try to be the caring and compassionate and understanding and treat them as my own family. I pledge to always listen to my patient and treat them with empathy and compassion. I pledge to always take the time to speak to patients and their families and ask them how their day is and how I can help them to feel better. My pledge is to get a pledge tree at UWS Ayr. I pledge to be conscientious and resilient. I pledge to always treat my patients with dignity, kindness and respect and to always encourage my patients to make decisions and choices about their care in any circumstances and without judgement. I pledge to ensure older vulnerable adults can live as safely as possible within their own community for as long as possible and building their confidence to do so. I pledge to set up open forum with the carers in Lizdean that work with wonderful clients with dementia. Improve communication channels. I pledge to see beyond the illness and take the time to see the person and build trusting relationships. I pledge to be you voice when you can’t be your own. I pledge to know the person and what is important to that person. I pledge to take time to learn about the person I’m caring for and look beyond their illness. My pledge is to listen to ‘everyone’ and try my hardest to make these things happen. I pledge to be the best nurse I can be, to provide the best care to patients in the toughest times of their lives, to laugh, cry and talk with them – to ensure they feel understood, valued and supported – and get the compassionate care they deserve. My pledge is to slow down and take more time for loved ones. I pledge to provide the best personalised care possible and within my capabilities. Looking at the person and not the diagnosis. I pledge to break the stigma within mental health. I pledge to always to take time to listen, be compassionate and care and make a positive difference in people’s life. I promise to always view the person and not the condition or ‘the patient’. I want the person/people to feel respected, loved and dignified during their care. To always be kind and empathetic. I pledge to be a kind, loving, willing, sympathetic ear for people when they are at their most vulnerable. To play the best part that I can in their story and to do my best to help that story continue. My pledge is to respect patients and treat them the way you’d want to be treated yourself. I pledge to try my best to listen to the story of everyone I work with. I pledge to always ask people and their families what matters to them and how I can help them. I pledge to make every patient I care for feel of worth. To make them realise that there isn’t anything or anyone more worthy than them and their health. My pledge is to look at patients as a person and not as their condition. I pledge to always see the person living with dementia as a person/individual. I hope to always be the nurse a family and patient can rely on. I pledge to help an support the families and patients living with dementia. Open my heart to comfort an care for them. My pledge is to continue to care for people the way I would like a member of my family to be cared for. I pledge to treat every individual as the person/personality that they are not to treat them as the condition they have. My pledge is to become the best nurse I can possibly be. My pledge is to become the best nurse I can be. My pledge is to be the best possible nurse I can be, to always give that extra 10% and smile. I pledge to listen and find out about people’s lives and who they are, what matters to them. I pledge to always listen to the people I meet, to always be compassionate, caring and respectful towards the people I care for. To always get to know them while I care for them, to always provide the best possible care I can to both patients and their families. I pledge to ask you your fears, and to ask you what your hopes are and remember them. I pledge to always treat the person I care for as a person and not their disease. To make every decision I make in honour of my amazing neighbour I looked after and do her proud. I pledge to always take time to get to know the person I care for, to always listen and understand, and to always be there. I pledge to take the time to listen and continue to listen, getting to know the person and who they are not the dementia. I pledge to never forget the privilege it is to be part of someone’s journey/story. I pledge to listen, to care and to show care. Find out who the individual is and what is important to them.